Tire & Wheel Lock with Keys is used on E-Z-GO Electric and Gas Vehicles and is compatible for using on ATV's and other manufacturer's vehicles. 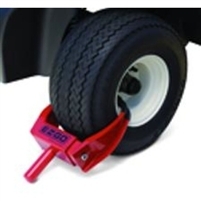 This item offers a safe method for protecting your golf car and keeping the wheels in place so that vehicle remains stationary. NOTE: There are no replacement keys available. All keys are uniquely keyed by the manufacturer.